English-born Robert Salmon arrived in Boston in August 1828. 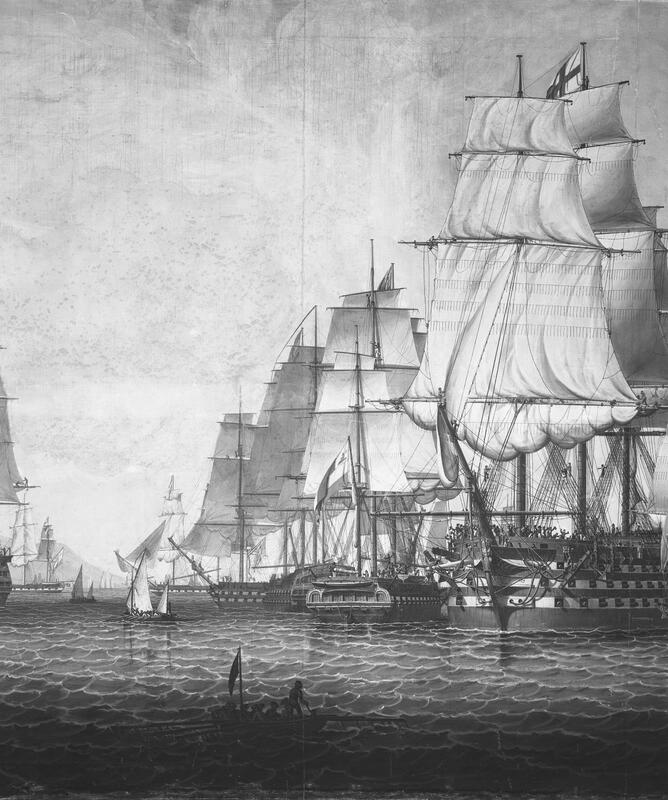 Soon thereafter, he began to work on a series of three large-scale paintings depicting events centered around the naval bombardment of Algiers in 1816. In addition to the MFA’s work, he executed a view of the city and a night battle scene (New Britain Museum of American Art, Connecticut, and location unknown, respectively). 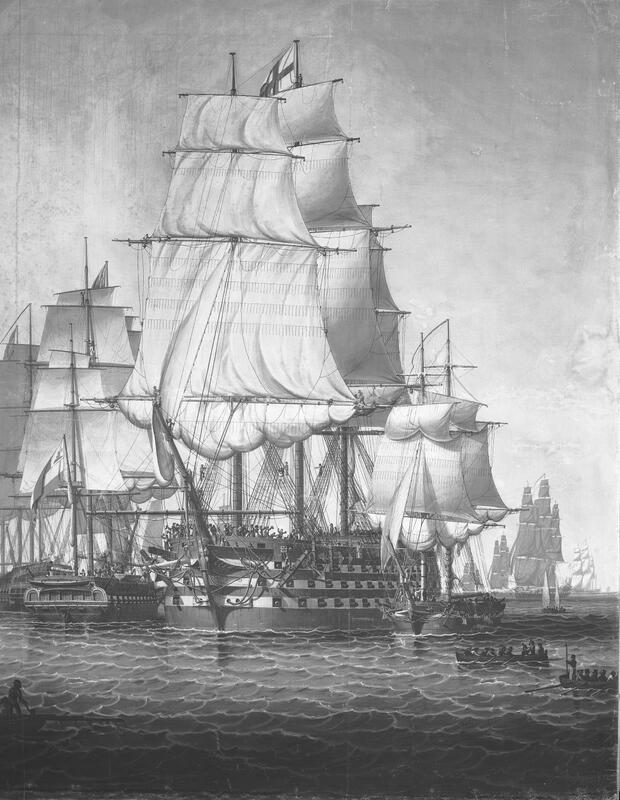 According to the numbered inventory of paintings the artist kept, The British Fleet Forming a Line off Algiers was 630, the first entry for 1829, and (in his spelling), “The second sean for sellf, begun the first Janewary, finished the 30. 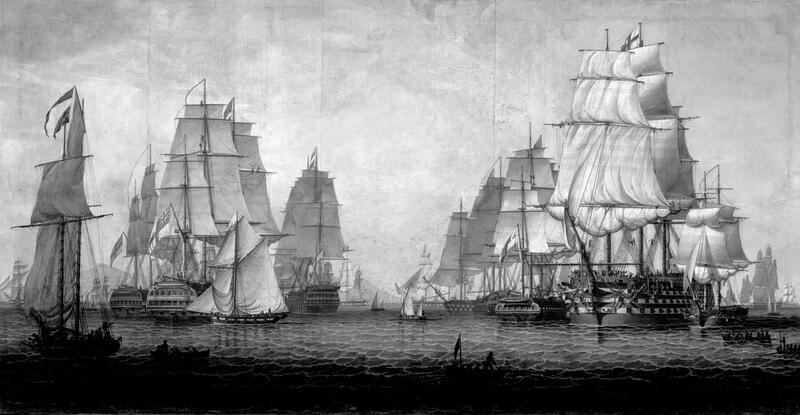 Vew of the British fleet forming the line in the vicinity of Algears.”Salmon chose his subject with care, selecting a theme that likely had resonance for his American audience, since the United States had been involved in war against the North African Barbary States for their piracy and enslavement of Christians as early as 1801. 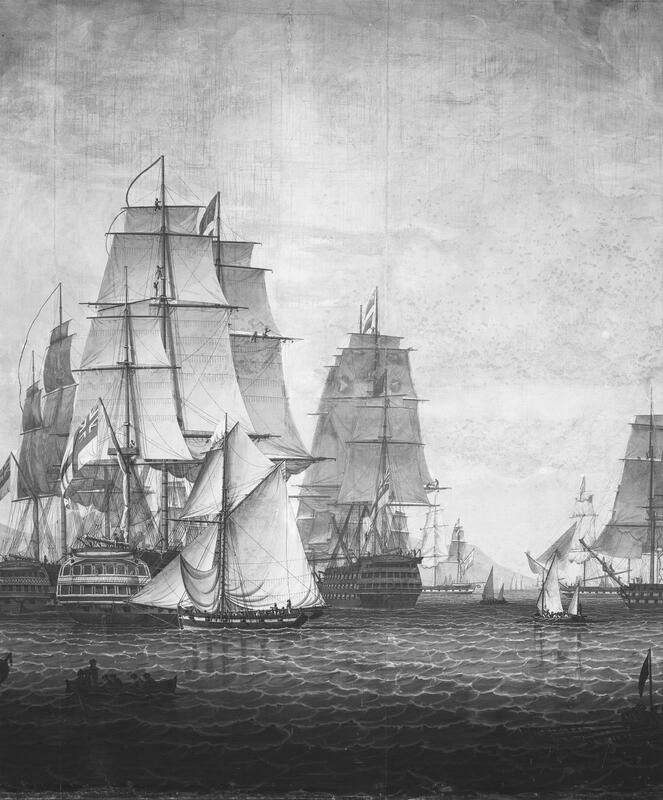 A series of naval actions followed, but were interrupted by the War of 1812. Naval hero Stephen Decatur brought Tunis, Tripoli, and Algiers to treaty terms in 1815, establishing a temporary peace.New trouble broke out with the dey of Algiers in 1815, and the British (with the Dutch) intervened in 1816 after violent actions were committed against English citizens. On a canvas over eight feet tall and more than fifteen feet long, Salmon represented the British fleet moving into position on August 27, 1816. The hills of Algiers are visible in the background. 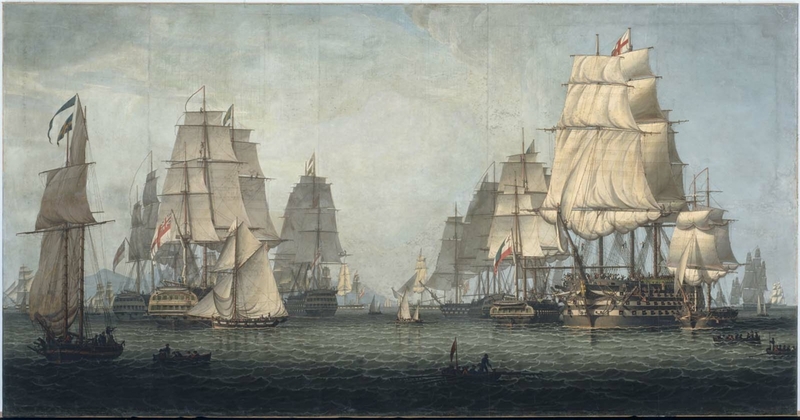 With great detail, the artist depicted a dozen British men-of-war maneuvering into line, with small boats plying the waters between them. The Algerians fired the first shots, answered in full force by British cannons. 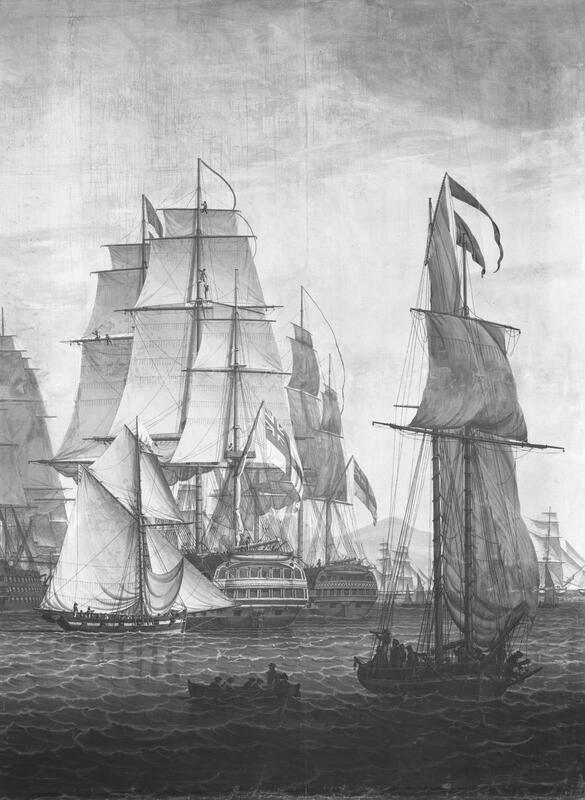 After the bombardment, the Algerian fleet was destroyed, the European slaves were released, and there was another temporary peace. Salmon may have been inspired to create his own monumental scenes after having seen panoramas of Algiers in Glasgow and Liverpool in the 1820s. A popular nineteenth-century entertainment, panoramas consisted of large paintings of spectacular places or events that were unrolled past the viewer, accompanied by music and narration. There is no evidence to suggest that the Salmon canvases were used as actual panoramas, but they were displayed together in 1830 to acclaim. One writer noted that “the entire exhibition is elegant, brilliant and edifying,” but he did not describe anything to indicate that the paintings were used as a moving panorama. The medium, however, casein on a fine canvas, was quickdrying and often used for theatrical set painting; from the speed with which the canvases were completed, it is likely that Salmon was anxious to capitalize on public interest. Mary Lee Ware inherited the painting from her father, Dr. Charles Eliot Ware, a leading physician in Boston; how he acquired it remains unknown. Mary and her mother Elizabeth also commissioned the Glass Flowers (the Ware Collection of Glass Models of Plants) now at Harvard University’s Museum of Natural History, donated in memory of Charles Eliot Ware. 1. Catalogue of Robert Salmon’s Pictures, 1828 to 1840, From his own Notes, Now in the Possession of Miss Darracott, 1881, manuscript, Boston Public Library. 2. Unidentified author, Boston Daily Advertiser, June 25, 1830, quoted in John Wilmerding, Robert Salmon, Painter of Ship and Shore (Salem, Mass. : Peabody Museum of Salem in association with the Boston Public Library, 1971), 39.